Welcome to the new Whippet World board. Here is a thread where you can roll out your new screen name and post pictures and experiment! If you are having trouble with any feature of the board please don't hesitate to ask any questions. Also please note that we have some very thorough HELP and FAQ areas which can also be of assistance. There are some general board use FAQ's to the top right below the banner. We have more Whippet World and Board specific FAQ's and tutorials in our HELP area in the banner on the bottom right. Re: Welcome to the New Whippet World! Introduce yourself! Hello! My name is Erin. I am a married law student in Virginia. I grew up with dogs, cats, rabbits, and other pets, but I have only been involved with whippets since 2004. My husband Patrick had his heart set on adopting a whippet puppy after growing up with a whippet, so after doing lots of research we found Scarlett in a litter announcement right here on Whippet World and I fell completely in love from the first moment. Soon after, we added Rose to our little pack. Rose was a shy 2 year-old who was turned into rescue before her breeder got her back and allowed us to adopt her. 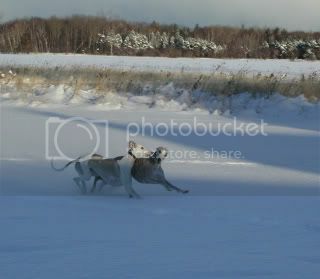 We are active in lure coursing and I hope to resume our obedience training soon. Hi, I'm Wendy. I am a transplanted Canadian (grew up in Southern Ontario) now living in Dorset, England. I've been in the UK since 1995 (spent the first 6 years in Scotland) when I married a wonderful guy, Nick, from Liverpool. At the moment I am a stay at home doggie mom to our four girls, Chelsea (a whippet/terrier mix) who got us into whippets, Savannah (our first whippet), Teya (who is out of Savannah's sister) and Drama (Teya's daughter from our first litter). We show Savvy, Teya and Drama under the afix (aka kennel name) of Chelynnah which is a combination of 'Chel' from Chelsea, 'elyn' from Telyn - Teya's full name, and 'nnah' from Savannah. We also do non-competetive agility with them when we can. You can find our more about us on our personal web page http://www.chelynnah.co.uk. Along with the whippets we share the household with Himalayian Sealpoint cat named Martin plus a frequent house-quest tuxedo-cat named Puddins, 4 parrots, and a koi pond. I show my dogs and also let them enjoy themselves lure-coursing. Hopefully in 2009 we will hear the pitter-patter of tiny little paws as we have planned a litter. Hi! I'm Melissa. I'm an architect, pharmacy student, and soon-to-be mom. I live in Georgia with my hubbie and two wonderful whippets, Piper and Jack. I don't post as much as I used to, but I still read and share along in everyone's stories. I can't wait to see how everyone feels about the new board. Hi I am Linda and I live in Victoria, Australia with my 5 whippets Penny, her two sons Tag and Puck and Kibah and her daughter Feather. Looking forward to seeing how the new board operates. It's looking great so far. 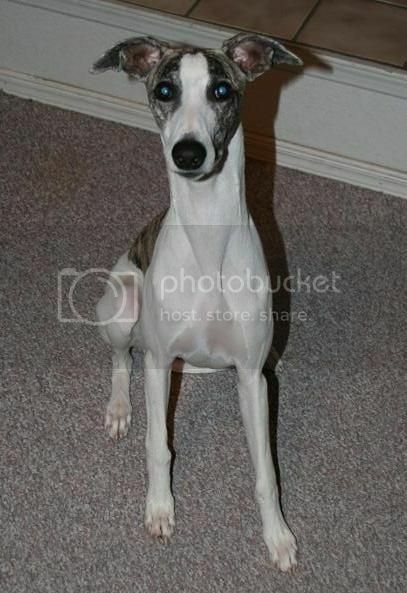 I'm Anne, I live in Washington state with my 3.5 whippets. The .5 lives with her breeder. At home I have Melba, who is in my signature, my white wonder. Bella is my little brindle wild child. Twix is my BIG fawn brindle boy. .5 is Audre who is my lovely fawn brindle and white youngster. I also have a token Jack Russell named Buster who is 14, blind and a smidge chunky. LOL! Audre being cute at 6 months old. This is Twix, being a man. Bella out in the yard with her piggy. Buster nice and close so you get all the wirey haired goodness. http://melbiesmusings.blogspot.com/ See what Melba and the Due West Crew are up to! Awwww look at that little fuzzball!!! My name is Patty. I live in Michigan and I am married to Bob. I have 2 whippets. Kasey "Jaama's Canes Venatici", and MacGyver "Can. CH. Devonair's MacGyver Remus". I have been a member off and on here for 3 years. I love this format..
Forgot to upload a pic of the boys. Here is a snow pic from last year. Greetings! I'm Brigitte and I live in Maryland, just outside of Washington, D.C., where I work as a journalist on the U.S. political beat. My passion is Whippets, and I do rescue work, show a little, lure course a little, race a little and do obedience and agility. Bambi was my first, coming into my life in the spring of 2000. She is a Delta Pet Therapy partner and together, we're involved in a READ program. Rudolph joined us in 2001 as a companion to Bambi, and he excels at lure coursing, agility and food thievery. My population doubled in 2005 with the addition of Summer, a showgirl who finished her championship in record time, and Daisy, a tiny rescue who stole my heart while I wasn't looking. 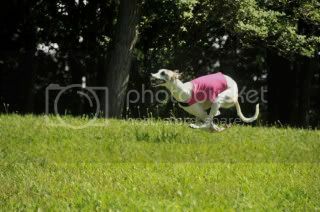 For information on how you, too, can adopt a heart-stealing Rescue, please visit http://www.whippet-rescue.com. Summer was bred in 2008, and Pony is the daughter I kept from that breeding. For more information about my crew and what we're up to these days, please visit us at http://www.GreenwoodWhippets.com. I think the holiday photos are the only ones I have so far of my whole crew together. It's hard to get all five in position for a single photo. My name is Carol & I live in Dorset, England with my blue whippet named Banjo (Bluegrass Banjoman) & a Japanese Chin named Aida (Ch. Sleepyhollow Aida). Banjo is my 4th whippet & the maddest of them all. Within six months of getting him he managed to knock me over & sprain my ankle & later break my nose. Luckily I still love him to bits! Aida came to me a couple of years ago to keep Banjo company. She had retired from the Show ring & now enjoys long walks in the forest. I am sure the new Board will be enjoyed by all who join it. 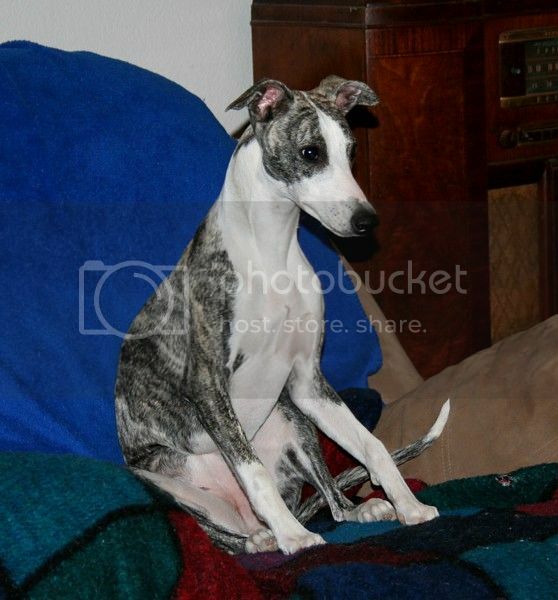 Hi, I'm Marcia, I originally joined Whippet World in September of 2003. 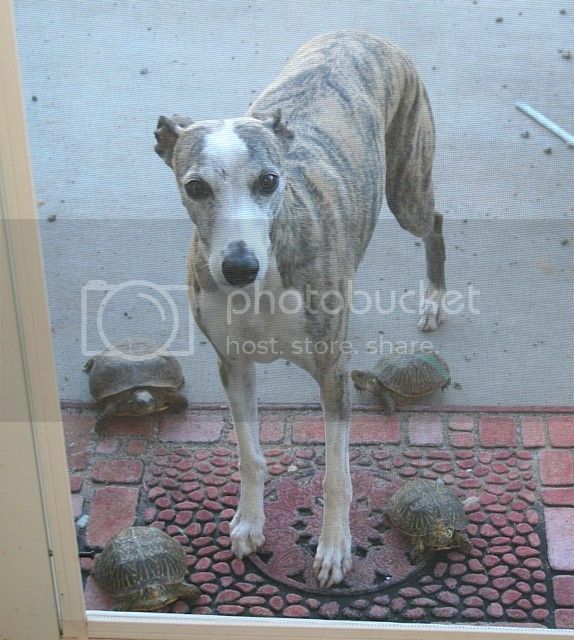 I live in southern New Mexico in the USA with my three whippets and some desert box turtles. The dogs and I enjoy agility and showing in conformation. and Tessa's two pups, who will be a year old at the end of the month. I am Susan and I live on three acres in Southwestern Washington with about a dozen whippets, three toy poodles (two of them rescues) and one paranoid cat! Oh, and a teenage daughter and my long-suffering husband. I am involved primarily in performance with my dogs (the whippets -- not the poos! ), oval and sprint racing and the occasional lure course. I love watching my guys run, and racing gives me the opportunity to be competitive and athletic-by-proxy, as well as keeping my pets fit and happy. I haven't designed a signature or uploaded an avatar yet...I'll do that very soon! I'm Wendy, was GreyFind on the MSN group, and I'm a recent transplant to Jacksonville, FL with my husband, 2 dogs (whippet & greyhound), ocicat, tortoise, and various other creatures. I work in online community management and do web site design and programming in my spare time. I've been part of the Whippet World management team since Sept 07 and am very excited about this move. It's given me a chance to flex my programming muscles quite a bit and I've enjoyed the challenges of getting it up and running. Hi, I'm Terry (or tk has my students call me.) I live in Durham, NC, grew up in MN (yes, I do fit the Minnesota farm girl image!). I run a program at Duke University and I do bleed Duke Blue. wiggies (from Claudines ooppps litter). Sterling will be joining our house and Heff will be going to Marysue in Wilmington, NC. My whippies love to play at the beach and sit on the deck and watch everything. 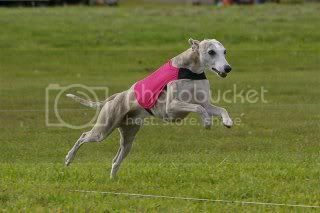 I would love to try lure coursing so I will be asking more questions about that. Grace who will be 6 in Oct.
Hailey will be 10 in Oct.
Winston is our old one he will be 12 in April.